What's the difference between raster and vector images. This PS Print guide goes more on-depth about the differences between raster and vector files. 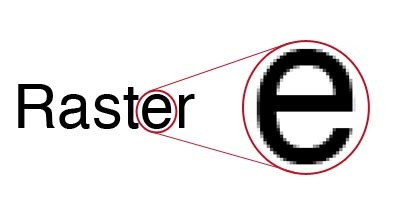 Raster (or bitmap) images are generally what you think about when thinking of images. These are the types of images that are produced when scanning or photographing an object. Raster images are compiled using pixels, or tiny dots, containing unique color and tonal information that come together to create the image. Since raster images are pixel based, they are resolution dependent. The number of pixels that make up an image as well as how many of those pixels are displayed per inch, both determine the quality of an image. As you may have guessed, the more pixels in the image and the higher the resolution is, the higher quality the image will be. For example, if we scale a raster image to enlarge it, without changing resolution, it will lose quality and look blurry or pixilated. This is because we are stretching the pixels over a larger area, thus making them look less sharp. This is a common problem but can be remedied by using raster image editing programs such as Photoshop to change resolution and properly scale images. Instead of trying to keep track of the millions of tiny pixels in a raster image, vector images, or line art, keep track of points and the equations for the lines that connect them. Generally speaking, vector images are made up of paths or line art that can infinitely scalable because they work based on algorithms rather than pixels. One of the greatest things about vector images is that you can re-size them infinitely larger or smaller, and they will still print out just as clearly, with no increase (or decrease) in file size. If you remember back to your high school geometry, the equation for a circle of center (h,k) and radius r is (x - h)2 + (y - k)2 = r2. If you want to make the circle bigger, you just increase the value of r - instead of having to keep track of tons more pixels, the computer just has to keep track of a different number. That takes almost no file space at all. 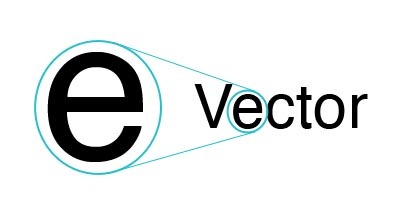 So, what types of graphics would typically be vector? Well, almost all computer font files are based on vector images of the letters - that's why it's possible to scale them WAY up or WAY down and still have the letters be clear. All Microsoft Office clipart uses vector art and most charts and graphs produced by Office or by statistical analysis software are vector-based. Typically vector art is created in illustration applications such as Adobe Illustrator or CorelDRAW. Vector illustrations are great for logos, illustrations/artwork, animations, and text.